The plush five-star Westbury Hotel, located just off Grafton Street, is one of the great meeting places for Dubliners. 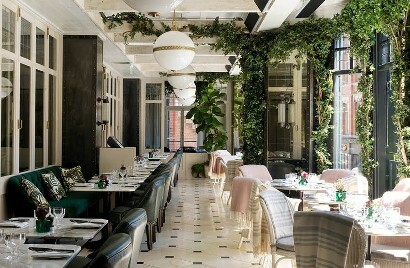 Having shopped until they dropped, women love The Gallery for light lunches, afternoon tea or cocktails; while Balfes Bar & Brasserie, which opened a couple of years ago, is their all-day, casual, street-level dining venue, being what they call a New York-style Parisian brasserie. of before, with an amazing interior decor that echoes 1930s art-deco glamour and style, plus the addition of a fabulous covered garden terrace and cocktail bar. It operates an extensive all-day menu of chic, contemporary-classic food, with something for everyone, which is really very convenient. No hanging around until 5.30pm for a restaurant to open, or indeed rushing in at 1.55pm, knowing the waiters and kitchen staff are shuffling around, hoping to get you out as fast as possible! on the bone is served a la meuniere. zingy Asian julienned-mango and beansprout salad with toasted sesame seeds. A Korean-style tempura of soft-shell crab jumped out at me. I loved the way it was presented — the crab was crisp, dry and crunchy, topped with a fiery split chilli, and served with a little pot of intense black bean sauce and fermented slaw to the side. I’d go back for that alone! From a “Rare Breeds” selection, including burger and fries, corn-fed poussin and pan- fried veal liver, Paul had three grilled, French-trimmed, perfectly ‘pink’ lamb chops, sitting on Moroccan-style hot harissa paste with simple dressed leaves, and a side of fries. I followed up with a starter portion of linguini, which, again, was beautifully presented. It was topped with palourde clams, shielding divine Castletownbere scallops, and the pasta was lightly tweaked with chilli and garlic. We shared a lovely pear and praline cake, which was artfully presented. at, Monday to Thursday. On Fridays, they do a lobster moilee curry; and on Saturday and Sunday, they do a roast sirloin of beef with all the trimmings. The executive chef here is Sandeep Singh, and we certainly loved his top-notch clean-cut cooking and high-end presentation. I can’t wait to try his lobster moilee!